Ms Van Eesbeck’s 6th class have been very busy preparing an action poem for the Arklow Music Festival. Ms Van Eesbeck wrote the piece herself and it it called Happy Ever After The class performed the piece to an extremely high standard and were awarded second place in a competition where the placings were closely contested. The adjudicators were extremely impressed with Ms Van Eesbeck’s writing and the children’s performance . They did the school proud. Fifth Class have been very busy learning all about the Great Famine. They presented their learning in the form of Powerpoints. Please take time to read them. They will be uploaded in groups onto this page over the next couple of weeks. 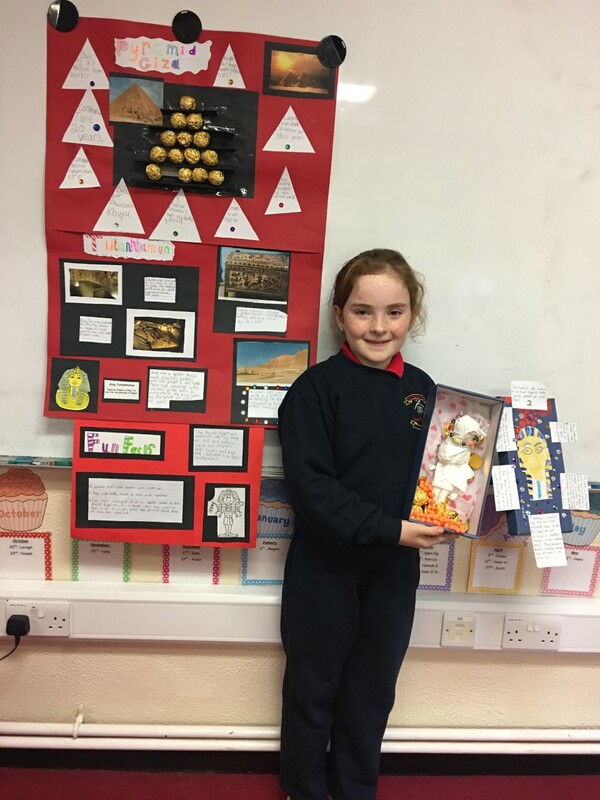 We have been busy learning about the Stone Age in 4th class. 1.We learned that there were 3 periods of the Stone Age: 1. Paleolithic, 2.Mesolithic and 3. Neolithic. 2. The Stone Age people used wooden and stone tools. 3. A modern man’s brain is three times bigger that the brain of an early Stone Age man. 4. Stone Age people did cave paintings. A discovery in Lascoux, France was made. Lots of cave paintings were discovered. 5.Stone Age children did not get to go to school. 7. They had to hunt for their own food. 8. Their houses were made out of wood, wattle and daub. 9.The Stone Age began in Ireland at Mount Sandel, Co. Derry. The Stone Age people first lived along the coast and ate fish for survival. Last Thursday our class made chocolate Rice Krispie buns. Everyone in the class took turns to make them and it was so much fun! Mid –Term Camp at Avoca N.S. A Mid –Term Camp will take place at Avoca NS on Thursday, 21st of and Friday 22nd of February. It will run from 8.30 a.m. to 6.30 p.m. Half –day options are also available. This camp is open to all students in the school. It will consist of indoor and outdoor sporting activities, arts and crafts. A nutritious meal and health snacks are also provided. It is being run by KidsInc- the people who provide the afterschool childcare. For more information or to book please phone Natalia on 086 1592141 or email Natalia@kidinc.ie. See attached flyer for further details. Kids Inc have also included more flexible options in relation to the Sibling and Homework Clubs for the remainder of the year. See fee schedule below. As you can see from these happy faces , the children have thoroughly enjoyed learning about Egypt. Well done ! https://www.irishtimes.com/news/science/young-scientists-you-say-tomato-they-say-excellent-hand-wash-1.3753948. Many thanks to Ms Van Eesbeck , Ms Creaton and Ms Lawson for their assistance with this project. Avoca N.S was full of Christmas cheer during the month of December. Children and teachers were busy preparing for the annual Christmas concert. We had to put on two performances to accommodate the crowds of people who wanted to come and see us. We stated off with a prayer service and then' Ava and Donnacha introduced the Junior Infants who sang two songs: ‘Rocking Around the Christmas Tree’ and ‘Rudolph the Red Nosed Reindeer’. Next came the Senior Infants who sang’ Here come the presents’ and ‘Baa Baa Bananas’. First Class wanted to wish everybody ‘ A Merry Christmas’ and also requested an elephant off Santa for Christmas. Second class sang ‘We Beseech Thee’ and gave us a great rendition of ‘Shotgun- Santa Style’. Third and Fourth classes joined forces to give us a great rendition of’ The Grinch’, ‘It’s Christmas Time’ and ‘ A Sky Full of Stars’. Fifth gave us a lovely recital of’ When a Child is Born’ and ‘ It’s a Wonderful Time’. 6th class sang ‘She’s the One’ and gave us a lively delivery of their memories of Avoca School. This was followed by the choir who sang O Holy Night in addition other carols. They rounded off what was a great show with their beautiful singing. Well done to all involved for putting on a great show. There are excerpts from the Choir and 6th class performance available on this website. Other classes will be uploaded over the coming weeks as videos become available. The above is an excerpt from our school choir performing at the school Christmas concert in December. 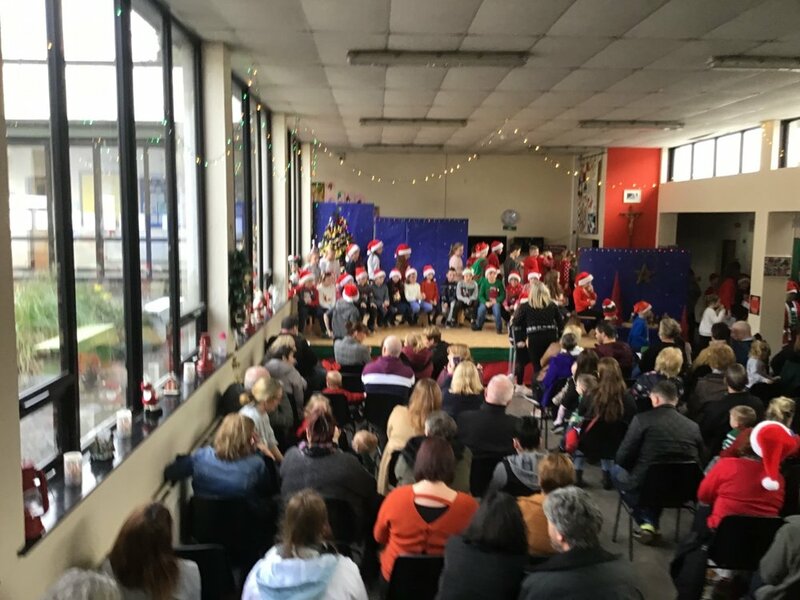 The 6th class performance at the school concert in December.Excerpts from other classes to follow over the next few weeks. On the 30/11/18 Avoca N.S. Gaelic team went to Aughrim hall to play a blitz. There were two Avoca teams. They were playing against Aughrim`s two teams, St.Joseph’s two teams and one Crossbridge team. The first Avoca team won three matches, drew one and lost one. The second team won four matches and drew one. A special thank you to Martin Kenny for coming. 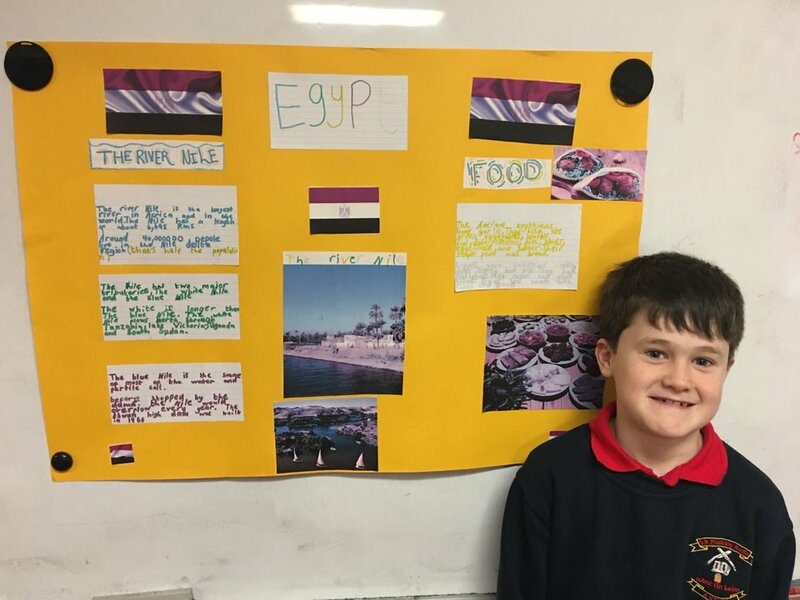 This week we can see more of the fantastic projects that the 3rd class have been doing on Egypt. 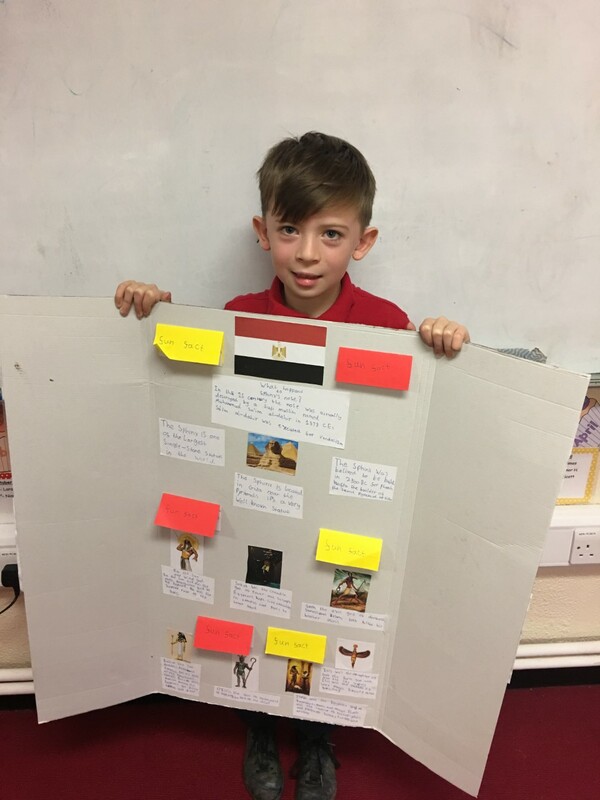 These children have used a variety of media to display their knowledge on Egypt. “It’s a brightly lit night, the moon is shining through the dark clouds and I run through the hospital barely making a sound. I reach the morgue. I fiddle with the master key and after some struggle the door swings open. I grab what I need and sneak out the door.I race home coughing and spluttering from the stench of the bloody limbs and organs. When I reach my lab, I begin to stitch the limbs and organs together.” I shall call it PROJECT X” I bellow. My words echo through the lab.It starts to twitch and moan, the sound echoes through the halls. Then it sits up and begins to mutter “H- Hello “.It tries to stand up but collapses to the ground. Then it begins to crawl and scratch my leg.I scream and leap on to the table and start beating it off with a broom.It bites at the broom,yanks it out of my hand and them starts to eat it. I am confused as he has no teeth yet.I scram and I shout till it crawls into the corner and I sedate him. Three years filled with experiments, fear and happiness. Later X is speaking and walking… He cannot speak much English but is fluent in Italian as I had given him the brain of the ‘Doctor Ecablo’ an Italian scientist. X is crying while doing his homework.”Sún ono Idiota” he screams and runs out of the room and up the grand staircase to PROJECT X.2’s room.I run after him and faint in horror as he ate X.2’S lifeless body, slurping the liquid out of the carcass barely stopping to breathe. I open my eyes slowly, shaking my arms and legs… I try to stand but I am shaky and cold. I don’t hear anything but I feel something crawling up my leg.. I look down and scream. X.2’s paw is crawling up my leg"! I can’t get him off.”HELP ME!” I can’t breathe… I’m shaking and I can’t breathe… They both appear and start to devour me… I shake and stir as X and X.2 tuck into my carcass… X and X.2 run out with my blood dripping out of their mouths. I am still able to think and slightly able to move. I am in a great deal of pain.I can’t speak but I’m screaming loudly in my head, so loud that it starts to shake and then suddenly a bloody X is sitting and in his mouth is a woman’s head. A fresh kill for X as her lifeless eyes roll around in her head till nothing but the whites of her eyes are showing. The mouth is gasping open and I squeak in fear of her blood dripping on to my body… I hear X rustling in the drawer. I feel him stab a needle in to my wound and start to stitch it.He lifts me and places me on the operating table, then he grins a sickening grin and walks out. 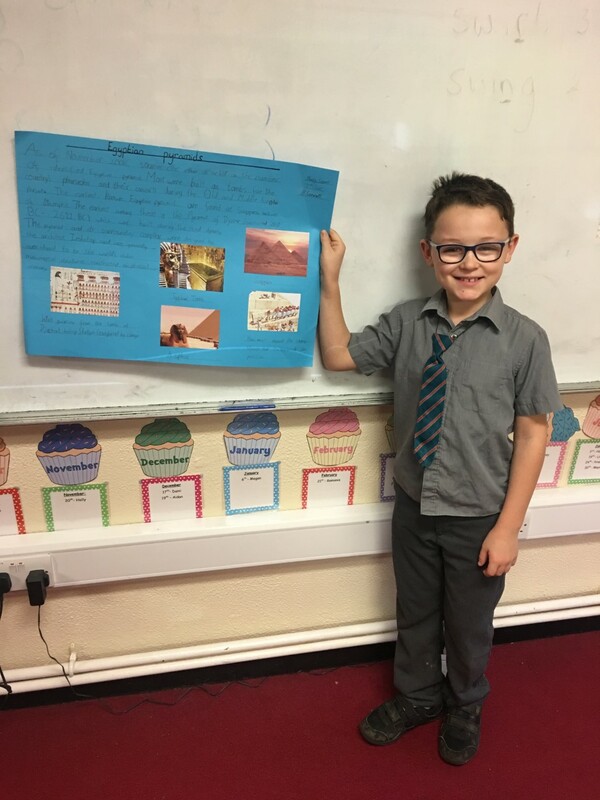 Third Class have been very busy learning about the Egyptians. They have been working very hard at demonstrating how much they know through their projects. They spent lots of time on these and used lots of different media to represent life in Egypt. Here we see a selection of projects. As time goes on more will be uploaded on to the Third Class Page. 24 children from Avoca N.S, competed at the Wicklow Invitational Schools event in Avondale on Tuesday, 20th of November. Our school was represented by Helen, Niamh,Casey Maya, Prince,Lucas, Sean O’ N, Ryan D,Aimee F,Aimee W, Rebecca, Irene, Rocco, Liam Jack, Michael, Ryan, Josh, Conor, Jack,Keeva, Carrie, Eve and Rebecca N. They had a fantastic day and competed well in their respective races. Well done to Helen who came first in her race. The learning community at Avoca National School would like to take this opportunity to congratulate Paddy (6th class ) on becoming a World Champion in Kickboxing . This World Championship was held at City West at the end of October. Paddy fought off stiff opposition from the Canadians to earn a gold medal and a World Champion Title. Paddy’s dedication to his sport has certainly paid off. Well done, Paddy. Paddy also took a silver in the points fighting contest of the Kickboxing competition. Donnacha from 6th class was chosen to represent Arklow Boxing Club at an international event at the Wildcard Boxing Club in Manchester. His opponent was a boy called Mike Duffy.It was a tough fight which went to three rounds. Donnacha represented his club and school well. He thought that it was a fantastic experience. He brought in his trophy and showed it to the entire school at Monday’s assembly. “Where are we?” said Zach to his friends, Paddy, Kian and John. No one answered. He looked over and didn’t see them. They had got lost the night before so they set up a camp. He went outside the tent and heard someone saying. “ Leave, leave, leave”. Zach shouted “Who is out there? !”The voice just continued whispering “leave, leave, leave.” Zach went back inside the tent and tried to think of old stories about the forest remembered a story about a demon. A satanic cult carried out rituals to summon a demon which was called “The Goatman”. Zach remembered being told about people going into the forest and finding bodies with goat skulls as heads. He was terrified to leave the tent. He was sweating and hyperventilating. After an hour he finally decided to leave and scout the area. Roughly 30 metres away he saw something hanging from the trees. When he got closer to investigate he realised it was John’s corpse with a goat’s skull for a head. His body was as white as snow and his fingers purple. Underneath where he was hanging there was something written with rocks. It was LEAVE. Zach was terrified and started bawling his eyes out. He started sprinting back to the tent. On the way back he thought he saw a man with horns and dark red eyes. He knew the ‘The Goatman’ was real. He was terrified he started crying. For the rest of the day he didn’t move. He was too scared. The next day he peaked out of the tent and saw ‘The Goatman’ walking then turning into dust. He walked over to the opening ignoring his conscience telling him to go back . When he got to the opening he saw a faint light in the distance. He strolled over and saw an old broken shack. He heard someone shouting “Zach Help! !” then another shout “Quick,Quick! !” Zach realised It was Kian and ran in. He looked around and realised the light wasn’t on anymore. He heard a splat downstairs. He tiptoed to the stairs and hurried down, his heart was beating out of his chest. He turned around and saw Kian with a goat head on his shoulders he thought that it must have been rushed because the head was half way off his shoulders. There was a room on the other side of the basement. The door started creaking open. Zach (even though terrified) stumbled over boxes and books to get to the door .He heard a stamp of a hoof inside. He still pushed on. Inside the room he saw Paddy’s lifeless body on the ground with ‘The Goatman’ ripping his head off and pulling a goat skull out of, a pile. He then threw Kian’s head into a different pile beside Paddy’s head. Zach tiptoed up to the Goatman trying to surprise it, but it turned around and pounced on Zach. Zach screamed and hit back. But the Goatman was too strong with its large claws. It cut into Zach’s face, belly and legs. Zach started feeling weak with all the blood escaping from his body. With one last effort to defend himself he gorged one of his eyes out, but it did nothing. Avoca National School celebrated Book Week in style from Monday ,October 22nd to the 25th inclusive. On Monday the school held a ‘silent reading’ gathering in the hall. We also had the author Alan O’ Neill come and visit us on Wednesday. He read from his own work entitled ‘ The Beautiful Feather’. for the younger children and held a writing workshop for the older children. All classes participated in the poster competition and the winners were announced on the Wednesday. Thursday was our ‘dress up day’ and our ‘end of month’ treat day. . The standard was extremely high and all of the costumes truly deserved a prize. However, difficult decisions had to be made and the following emerged as winners from very stiff competition: Jayden Doyle,Aiden Fleming,Laragh O Callaghan,Eoghan O’ Reilly,Abaigh Mableson, Adam Connolly,Aoibhean Donnelly,Glen Murphy,Lily Bolger,Hannah Cawley,Fiachra Hegarty,Rebecca Nolan,Lauren Pender Barnes,Hannah Andrews,Abby Moore ,Leah Fox, Megan Porter,Freya Reddy,Molly Doyle and Joe Sinnott. Well done to the 6th class who orgainised a fantastic array of games and treats in the hall for all of the other classes. Games such as ‘Name the Skeleton, Shoot the Balloon and others ‘ went down a treat’.TThere are a tiny selection of pictures from our Book Week to be seen below.